The Miami Metropolis, forerunner of the Miami News, published its first issue on May 15, 1896. It was the first newspaper in Miami and the first issue was published two months prior to the incorporation of the city. 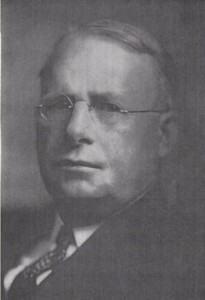 The Miami Metropolis was purchased by James Cox in 1923. After acquisition of the paper, James Cox purchased land on Biscayne Boulevard and erected the Miami News Tower. The tower is now called Freedom Tower. Also in 1923, Cox changed the name of the paper from the Metropolis to the Daily News. James Cox was the Democratic nominee for president in the 1920 election. His running mate was Franklin D. Roosevelt. Cox came to Miami based on his friendship with Carl Fisher. Fisher was the one who suggested that Cox purchase the Metropolis to give him something to do while spending his winters in Miami. Read more information at “Journey Through My Years” by James Middleton Cox (pages 309 – 323). Miami Metropolis building on Avenue D (Miami Avenue), in 1896. Courtesy of HistoryMiami. 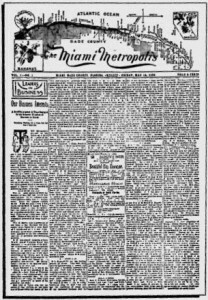 First issue of Miami Metropolis on May 15, 1896. Courtesy of Polk City Directory. Portrait of James Cox. Photograph by Don Wallace.